Mako and Kraken were choose your seat as usual, so it was just Manta that was only letting you sit in the front part of the train. Hopefully I can sneak back over in the next few days to get a ride towards the back. Planning a trip to SWO for the last full week in April, and I wondered whether it'd really be necessary for me to get QQU for my kids and myself. It's not even good for Kraken, and my previous experience was that SWO doesn't have really bad waits for their rides. I'll be going on either a Monday or Tuesday of that week. Thanks in advance for the input! DILinator wrote: Planning a trip to SWO for the last full week in April, and I wondered whether it'd really be necessary for me to get QQU for my kids and myself. It's not even good for Kraken, and my previous experience was that SWO doesn't have really bad waits for their rides. I'll be going on either a Monday or Tuesday of that week. Thanks in advance for the input! Honestly, I don’t think that you’ll need it. We went on a Tuesday in August and walked on Manta at opening and then rode it again with a short wait. We rode Mako 4 times in a row and never waited more than 10 minutes. We rode it a couple more times later in the day and it was still only a 10-15 min wait. We did wait about 45 minutes for Kraken, but that was with the stupid VR. Now that they’ve taken the VR off, you won’t have that problem. The VR is listed as "temporarily unavailable." When I was there this past week, Quick Queue was valid on Kraken. You could only use it on Row 7 though. If you get to SeaWorld at opening (9 am), you should be able to get rides on Manta, Atlantis, Kraken, and Antarctica in the first hour. Mako opens at 10 and is a capacity machine. I haven't seen the line longer than 10 minutes myself. By midday, I've seen Antarctica, Journey, and Manta post 30 minute waits, but the lines seem to dwindle back down towards closing like many parks. On busier days, just watch the time of the dolphin show, when that lets out they all go to Journey to Atlantis and Turtle Trek (and to a lesser degree Manta). JTAs line, on a hot day, will jump dramatically when that show lets out. At least it always used to -- Same goes with Wild Arctic when the Orca show lets out. Just something to keep in mind if you are watching the shows. Get in quick, or go farther away from the stadium. Canobie Coaster wrote: The VR is listed as "temporarily unavailable." When I was there this past week, Quick Queue was valid on Kraken. You could only use it on Row 7 though. They open at 10am on the weekdays when they are going. This also means that Mako may not open until 11am (I've had this happen to me on a couple occasions). But the rest however is about on point for a weekday around that time. On a side note, on peak attendance days (like Spring Break, Bring a Friend month on weekends- usually in Sept., and holidays I've seen the line reach over 90 minutes for Mako. Of course they aren't going on a busy day so it doesn't apply. The only rides that carry lines at SeaWorld is Journey to Atlantis and Empire of the Penguin. The coasters are mostly walk ons. I visited this past weekend and Quick Queue was not needed. I've never needed it when visiting SeaWorld. The shows will be full, so always get there early for a decent seat. VR was not on Kraken and it doesn't look like it's going to return anytime soon. Today was the last day to ride Shamu Express. They have been announcing it at the ride all day (as can be heard in the video in the link below). It appears they have decided to get a move on with the Sesame Street transformation. The splash pad in the area has been blocked off for a couple months at least already. There has also been a lot of seating removed from around the play structure (which is to be removed permanently for the project). It just kills me with people taking the date the park gave last year as 2022 as if that's the end all...lol If I recall correctly, it was stayed by 2022 which means anytime before that. Last edited by bgtlover on Sun Apr 08, 2018 4:30 pm. -FINALLY bit the bullet and rode Mako in the front seat for the first time thanks to Boldikus and Coasterbill's recommendations, and... holy crap. While the back is definitely better down the first drop and is a bit more forceful on those final turns, front is absolutely my new go-to. Insanely strong floater, borderline ejector even, on the first few hills, and the view down the first drop is INCREDIBLE. Gives off SheiKra vibes, except way more intimidating with no OTSR on your body. So good. Gets me hyped to try out Apollo's Chariot since the last time I went to the park (2013) to compare the two. -The food was great! First time going to the SeaWorld version, and while I only went to four booths, everything I got was superb. Favorite thing was the Bacon Cheddar Hushpuppies from the North Atlantic Market. I swear I saw Jesus when I bit into one. Not the best thing bacon-related at the Busch parks, but it's close. -Rode Journey to Atlantis for the first time since the... um... "improvement"... yeah, not much to say here. Killed off basically any remnant of a comprehensible story the ride had, but the new score was a nice touch. The ride was as fun as ever, the infamous second drop didn't drown everyone on board this time to my pleasant surprise, and the coaster portion, while painfully short, has some wild laterals. I miss Allura. bgtlover wrote: Today was the last day to ride Shamu Express. It appears they have decided to get a move on with the Sesame Street transformation. The splash pad in the area has been blocked off for a couple months at least already. There has also been a lot of seating removed from around the play structure (which is to be removed permanently for the project). It just kills me with people taking the date the park gave last year as 2022 as if that's the end all...lol If I recall correctly, it was stayed by 2022 which means anytime before that. Woah, what? That's crazy that they'd close down the only kiddie coaster in the park without any warning. I was at the park yesterday, and there were no signs or anything. Weird. Shamu is now listed as SBNO on RCDb. RIP Happy Harbor I guess. 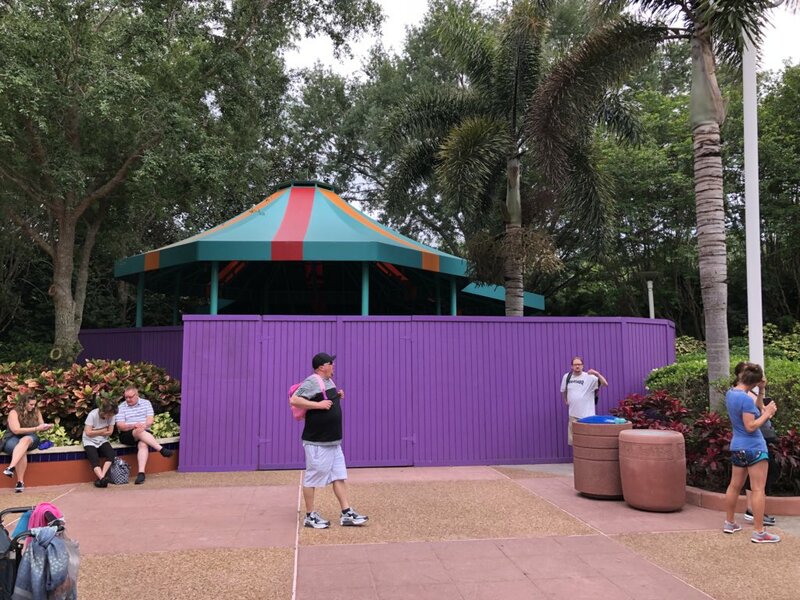 More walls up in the area (the splash pad has been walled up for awhile). [EDIT] I was informed the awning was removed some time ago ( I hadn't noticed my last visit). I looked back at photos and found it was. That is a new wall however in front of Swishy Fishies ( mini teacups). Dombot wrote: Woah, what? That's crazy that they'd close down the only kiddie coaster in the park without any warning. I was at the park yesterday, and there were no signs or anything. Weird.